So I thought I'd make another attempt at walking part of the Pennine Way starting from the Snake Pass, but when I arrived there at 7am on Sunday it was shrouded in low cloud, again. I thought it might clear so I set off walking but it was very cold, windy at pretty miserable so I went back to the car. On the way there there had been quite a bit of sun on the lower ground so I headed back down to Derwent Reservoir where it was much clearer, brighter and warmer. I've taken photos around here before and thought that this time I'd do more walking but take the opportunity to take some images suitable for processing to HDRs. Basically taking multiple shots with different exposures that can be merged into images with a High Dynamic Range. There is a setting on my camera which will automatically take a set of three images with different exposures which can be used for this purpose. A few weeks back I downloaded a trial version of Photomatix but I hadn't anything suitable to try it out with so this seemed an ideal opportunity. 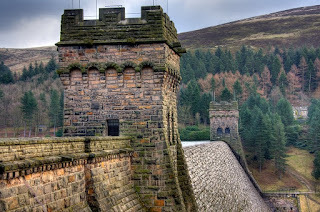 The wall of this reservoir has some really dramatic towers at each end and the wall in between acts as the overflow and when the water is high it creates an amazing waterfall. Unfortunately today the water level was a little low but it didn't adversely affect the aim of the exercise. This is the first image of the set of three that is at the correct exposure and has had basic processing to boost the contrast and colour saturation. To be honest I very much like this photograph and would be quite happy to put it into my online gallery and make a print to put up in my study. The subject is great, the composition is good with the nearest tower having wonderful detail and texture. The far tower almost mirrors the near tower and the wall between forms a fairly strong leading line. After that there are lots of little details to discover, the house in the trees on the right, the small building on the far bank on the left of the near tower and the path leading up from the bottom right. This next image is the HDR produced from the Photomatix tone mapping and after experimenting with the settings for quite a while I think has produced quite a pleasing result. The stonework and the background have a lot more contrast which brightens the whole image considerably. I've tried not to push it too far as sometimes I find HDRs take on a very artificial appearance, which isn't necessarily bad, but not what I was trying to achieve. When I compare this to the first image I am seeing that the first image is actually quite dull. In this final version I have converted the HDR version to black and white and pushed the contrast a bit further. In the black and white conversion I used mainly a red filter with a bit of blue which feels to have made a big difference in the contrast between the dark green trees and the light brown ones. I did think of converting the first image to black and white too but I don't think I'd get this same effect at all. This is my first experiment with HDR and I think I can see why many people are so enthusiastic about it. Apparently the human eye can see around 8 levels of exposure value (EV) whereas a digital camera can only capture about 5. By adding an extra EV above and another below and combining them we are reaching around 7 EV in the HDR. I guess using more starting images or spreading the range of the three exposures could push this a little further. Overall I'm liking the black and white version the best and I'm definitely going to make an A3 print to put on my study wall. I took quite a few other sets of images on the walk so I'm going to do some more experimenting of the next few days and maybe I'll post again later in the week and add some other pictures into my gallery. As what seems to be the norm at the moment the weather was a bit dull and cloudy when I have the opportunity to get my camera out, but I decided to make the most of it and set off for Fairburn Ings early. It wasn't open when I arrived but there is a second car park further along the road so I went there for a while. 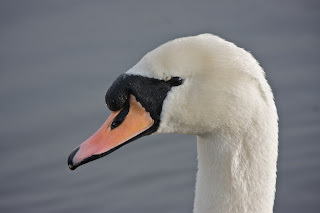 there is a bit of a path here but I didn't see much until I got back to the car park and got this close up shot of the swan. So then I went back to themain car park which still wasn't open but another car arrived and a chap got out to talk to me. I aske him when it opened and he said it was unusual for thegate to be locked but it should open very soon. He was teling me as we were waiting that he comes here three times a week and he loves the place. He told me all about everything that was in there and which way to go (not that there is a lot of choice). I met him again later and we had another chat. He was telling me he still uses a film camera and he was very interested in mine as he was considering going digital. Once inside I went to the kingfisher wall and saw a quick flash of something that may have been a kingfisher but I couldn't be sure. A chap with a camera, big lens and tripod turned up and told me he had taken a good photograph of the kingfisher yesterday (so I guess he was back to take a better one today). I didn't see anything else so I left him to it. On the way back I managed to get a poor photograph of a woodpecker here but still didn't see a kingfisher. I walked along the woodland path and didn't see much, then I walked along the river for a while and took this. Can you identify it? Here's a better picture. 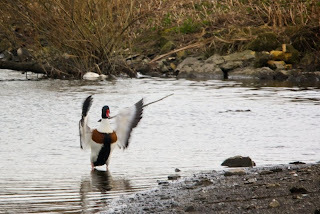 A bit later I went into a hide a there were a few birds which I managed to get some half decent shots of including this shell duck exercising its wings. I was just about to leave the hide when a couple turned up and I didn't want ot make it seem as though I was leaving because they had come in so I stayed a little longer. Then a little egret suddenly appeared, playing in a pile of twigs off to the left and then it hopped into full view directly in front of the hide. Managed a few shots before my memory card got full but it flew off while I was changing to an empty memory card. 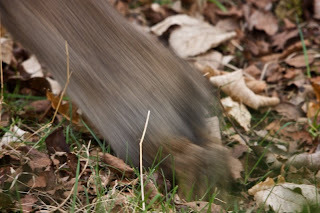 As I was heading back along the woodland walk I heard a noise in the undergrowth and spotted a little brown animal with something in its mouth running along. I spotted it agaiin running along the path in front of me and fired off a number of shots . 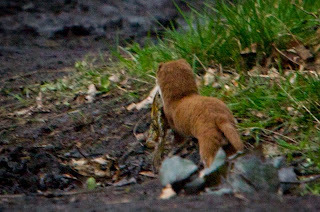 Unfortunately in my excitement I didn't have the camera set up properly so the shots were very dark but managed to boost them enough to get a few poor shots of this little stoat with a frog in its mouth. 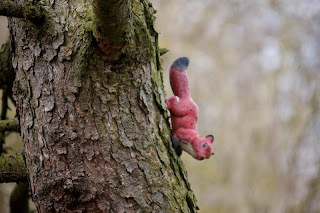 Back near the wildlife shop there was this red squirrel up in the tree. I wonder if its one that Liza was being warned about? It wasn't the most successful visit but there were definitely some highlights and I will come again when the weather is better and maybe I'll get some better shots. I have posted a few more shots from the day in my galleries. I've been very remiss with blogging the last few weeks so here's a quick catch up. Since the snow the weather has been pretty overcast most of the time so it's not been the best for taking photos. On the brighter side though I have bought a new lens for my camera which is a big(gish) telephoto zoom to replace the old one that I bought on Ebay for £50. It's a Sigma 120-400mm which on my camera gives it a long range of around 13 X normal (640mm). I was having a few days holiday so in the afternoon I bought it I went to find somewhere to try it out. 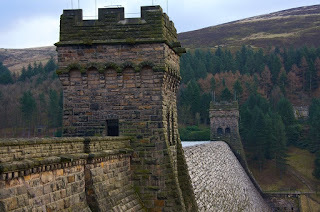 I went to one of the local reservoirs first but it was really cold and windy so I drove around looking for somewhere else to go. Ended up driving for a while but ended up at Worsborough Country Park near Barnsley. To call it a country park was a bit grand but for Barnsley I guess it was close enough. 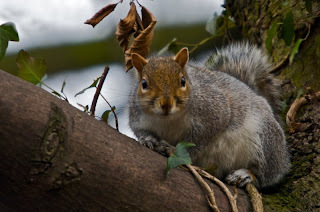 Took a few pictures of seagulls on the reservoir and on the way back to my car a couple of photos of a squirrel up in a tree. 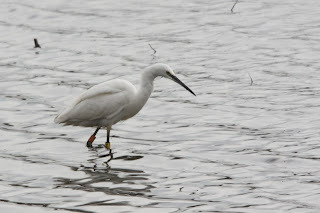 The following day I decided to look on the internet to find a better place for taking photos and found a Yorkshire Wildlife Trust place called Potteric Carr which looked promising. Again it was a bit dull but the sun came out for a bit every now and then. When I first arrived I was a bit self conscious about having this big lens on my camera but by the time I left after seeing what the other photographers were toting around I was feeling totally inadequate. There was't a great number of birds there and they all seemed very far away so I didn't get many decent shots. 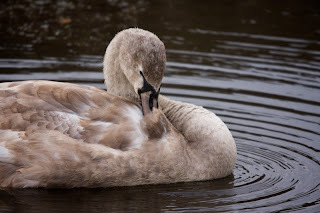 The saving grace was this young swan that was in a small pool next to one of the hides. 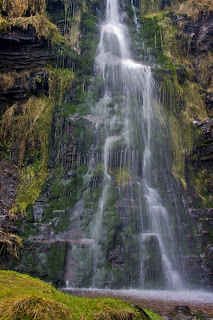 The next day I had some jobs to do but the following day I had planned to go back to the waterfalls near Holme village that I visitted last year near the end of a long walk from Crowden. I thought that with the last of the snow melting there would b plenty of water coming down the waterfall and I was right. It was a dull day again but it didn't matter because there waterfalls are generally in the shade anyway. There was still a patch of snow near the waterfall that hadn't yet melted even though it was nearly two weeks since the snow fell. I didn't use my new lens for the waterfall shots but on the way there I used it to catch a few fairly poor shots of the grouse in the distance. 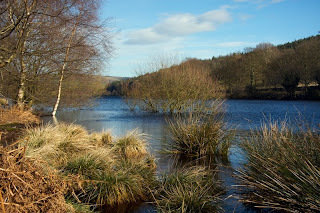 A couple of days later the sun did come out for a while but it was still quite cool so I headed to a reservoir that I've not visitted before near Bradfield. Dale Dyke has a path around it which was quite muddy and at the top end there is a path through the woods up to Strines reservoir. There is no path around Strines but it was very cold and windy when I reached it so I wasn't too bothered. After walking around the reservoir I headed up a path that went up one of the adjacent hills so I could take some shots looking down at the reservoir. So that brings me up to date as I haven't taken anything useful since. Not really had a good opportunity to exploit my new lens but I'm considering visitting a couple of RSPB places at Fairburn Ings and Dearne Valley so hopefully they'll better suited.